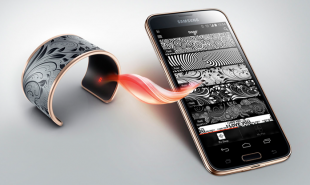 We have seen bracelets that can charge user’s smartphones and bracelets that can raise the alarm if the wearer feels endangered, and now a new smart bracelet called Tago Arc uses NFC and E Ink technology to enhance the original purpose of jewellery – to decorate and glamorize the wearer. Tago Arc, from Hungarian tech company Liber8, has recently completed an Indiegogo crowdfunding campaign, raising more than twice its USD 40,000 goal. Tago Arc is a cuff bracelet with an E ink surface, which syncs with the user’s smartphone to display any black and white design the wearer desires. Decorative designs can be purchased and downloaded from the tago arc app and creative sorts can even create their own patterns, which they can use themselves and sell to other customers, earning 40 percent of their retail price. Users simply select their desired design, place their smartphone on their bracelet and tap the transfer button on the app. The image will appear almost immediately. Then, the wearer can flaunt the design for as long or short as they like, changing to suit their mood, outfit or occasion. Liber8 plan to use the funds raised from their Indiegogo campaign to speed up the image transfer process and they will begin production of the item in 2016. Are there other items which could use E Ink displays to create personalized accessories?